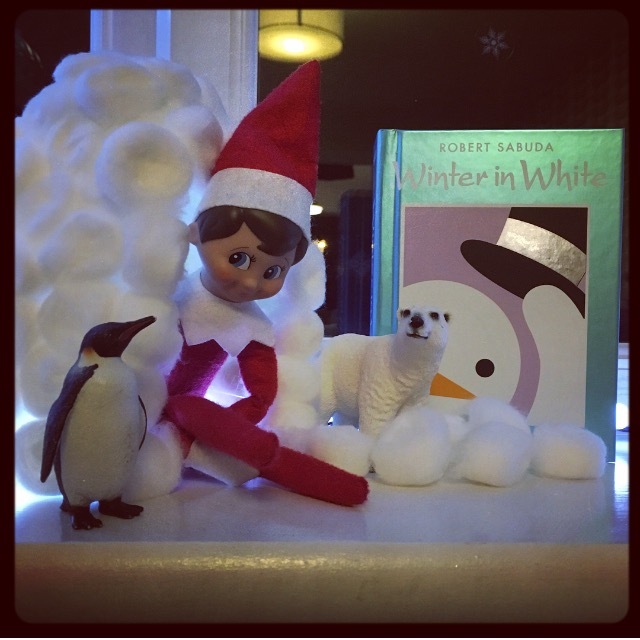 Well the first week of Advent seems to have flown by and, just in case you have missed our daily photographs on Instagram, we thought this would be the perfect time to share a round up of the festive books we have been reading, as chosen by our cheeky elf on the bookshelf, Elvis. So if you are looking for a little elf-spiration, you have certainly come to the right place! 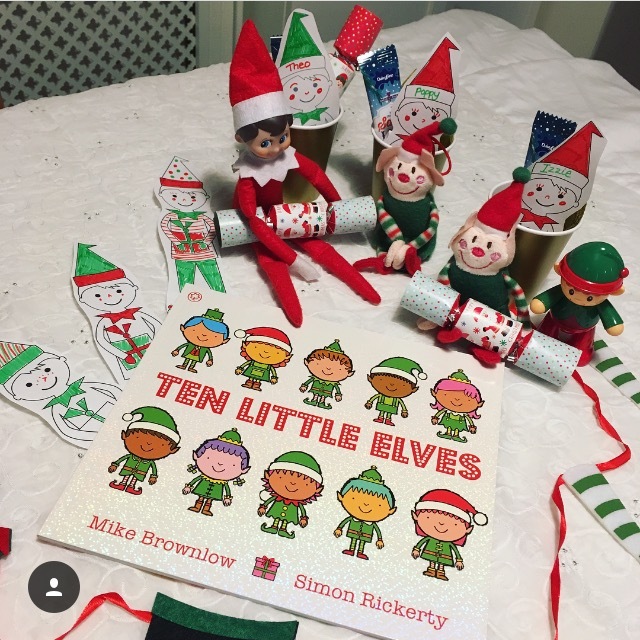 Our cheeky Book Elf, Elvis, returned and with the help of nine little friends threw the children an Elf Party. You can read more about our book choice, Ten Little Elves, here. 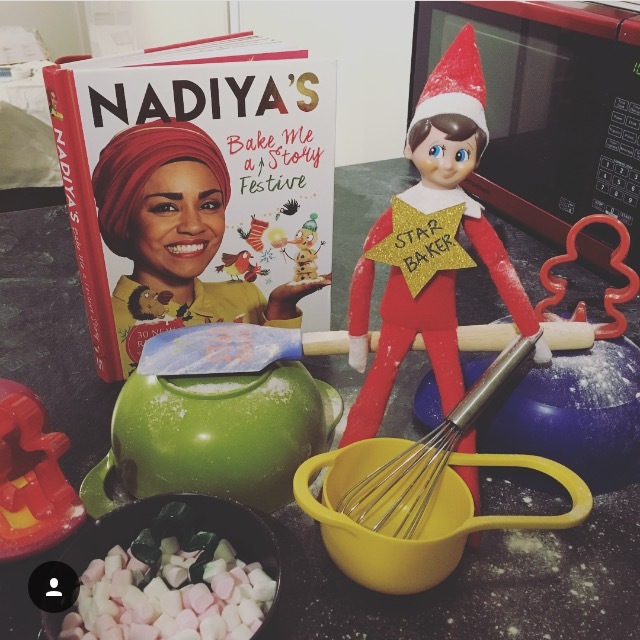 As we were heading the the BBC Good Food show on the Saturday, Elvis caused chaos in the kitchen before declaring himself Star Baker! 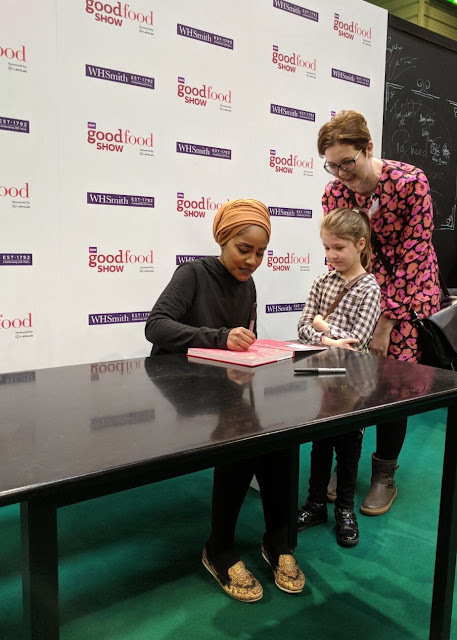 You can read our thoughts on Nadiya's book, Bake Me a Festive Story, here and Mini Reviewer, Izzie, was delighted to be able to meet her at the show! Day 3: Supertato: Evil Pea Rules! Elvis remembered to follow us to Grandma's house and in true "Evil Pea" style he upset the locals! You can read our review of the fantastic Supertato: Evil Pea Rules! here. 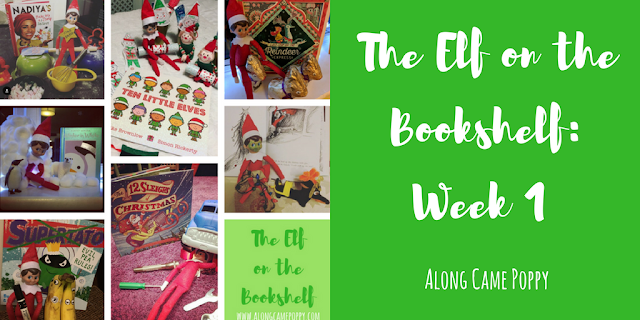 It would appear that Elvis came back from Grandma's house by reindeer and he also picked this stunning new book to read on day four, you can read our full review here. 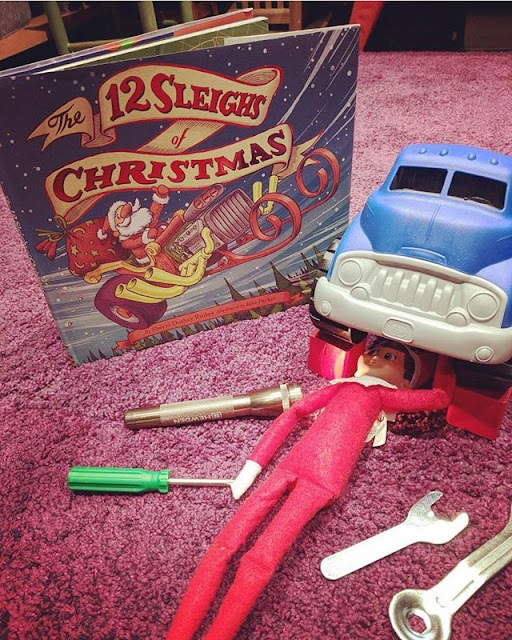 On day five, mechanic elf Elvis, was incredibly helpful in fixing all the toy cars. He also chose this brilliant book, The 12 Sleighs of Christmas written by Sherri Duskey Rinker and illustrated by Jake Parker. When the elves discover that Santa's sleigh has been trashed, they have a build-off to create it's replacement, but will they find the perfect solution in time for Christmas Eve? Well that would be telling! However, we can assure you that this book is packed with gizmos, gadgets, wings, springs and turbo engines. The elves let their imaginations run wild as they create 12 amazing, if some what crazy, vehicles! The rhyming verse and comic inspired illustrations make this story a must read for vehicle lovers young and old this Christmas. Needless to say, we loved it! So the children loved this little elfie igloo on day six, which is a good job as I had questioned my sanity as I sat gluing it together the previous evening and my husband definitely thought I had lost the plot! Our book choice was the beautiful Winter in White, which you can read all about here. Day 7: How The Grinch Stole Christmas! Elvis' final choice for week one was the classic and heartwarming story of How The Grinch Stole Christmas! It is a fantastic story to teach the true meaning of this special time of year. Mini Reviewer, Theo, received a lovely Dr Seuss collection as a Christening present in November and he has quickly become a big fan. It also seemed appropriate to include How The Grinch Stole Christmas! in our Christmas countdown as this year marks its 60th anniversary, which is quite unbelievable, so Happy 60th Birthday Mr Grinch! Publisher HarperCollins have released a beautiful new slipcase edition in celebration, you can see it here. You can also find a whole host of Grinchmas ideas including printables on the HarperCollins website here. We do hope you are enjoying the countdown to Christmas. It is so lovely to see the popularity of Book Advent growing. If you are doing something similar please do let us know in the comments below, we love hearing from you. *Disclaimer: Some of these books were received from the publishers for review purposes, however our opinions are, as always, our own. This post also contains Amazon affiliate links, you can read more about what this means here. 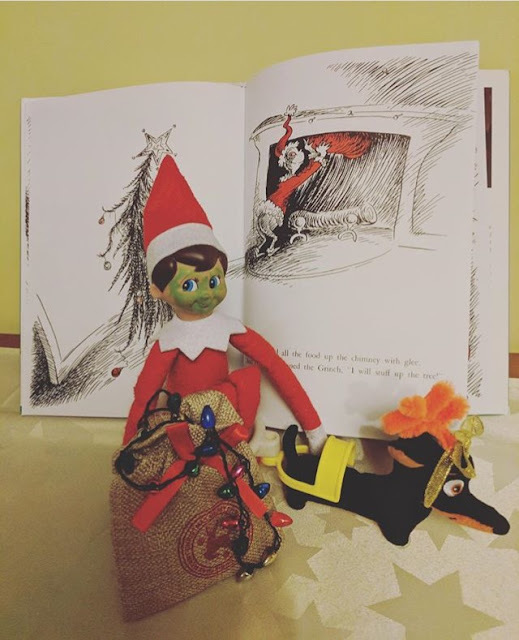 We didn't have an elf but our two little men, Snowy and Christmas, visited us for two years and set up scenes from picture books in the same way that you have. It was quite a lot of work (I spent one evening knitting with cocktail sticks!) but it was really worth it, my daughter's face was a picture every morning! 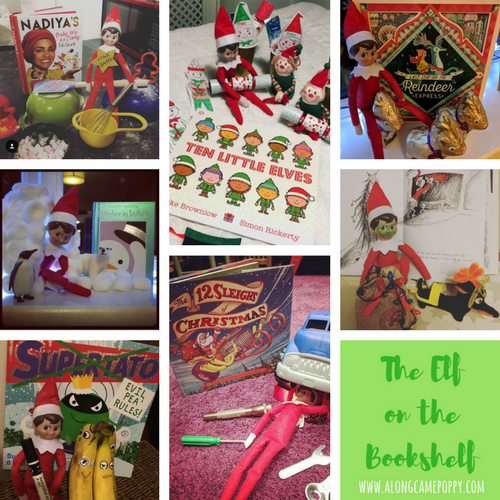 I look forward to seeing what your elf gets up to next and which books he chooses!! Aw, these ideas are so cute, the igloo looks great! Thanks so much for linking up at #KCACOLS. Hope you come back again next time. I need to get an elf for next year I think. I love the idea of book advent. What a nice thing to do. Thanks so much for linking up with #KCACOLS. Hope to see you next time.